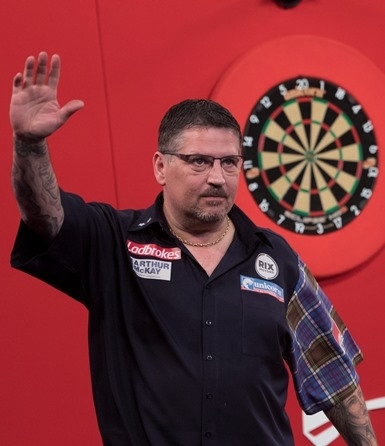 He was close but Gary Anderson’s bid to win a second Players Championship crown came to an end in the semi-finals in Minehead. The Unicorn star was edged out 11-9 in a thriller by Michael van Gerwen, who was then beaten 11-9 in an epic final by Daryl Gurney who claimed his second ‘Major’ TV title in sensational style. Gurney took out 85 on the bull to deny Van Gerwen a fourth straight Players Championship victory. The Irishman came from 9-8 down to take the win. Anderson will be disappointed after missing key opportunities.....he threw for a 4-1 lead but couldn’t capitalise. He missed ‘tops’ to go 6-3 up and was pegged back, and after striking back to level at 9-9 he threw for the lead but couldn’t buy a treble and Van Gerwen broke with an 11-darter and then won the match with a 121 finish. Both players averaged 103 but for Anderson there will be a feeling of frustration because he knows that he could have won two big TV titles in the last week but has just come up short. Unfortunately a case of what might have been. Anderson had seen off Jonny Clayton 10-4 with a 106 average in the quarter-finals. Chris Dobey’s run came to an end in the quarter-finals. There were two key moments in his clash against Daryl Gurney. At two apiece, the Unicorn youngster missed five darts to go ahead. Then in the 7th leg with Dobey sat on 32 to get back within one at 3-4, Gurney took out 146. The Irishman then found an extra gear and win eight straight legs, which included a 170 finish, to compete a 10-2 victory.